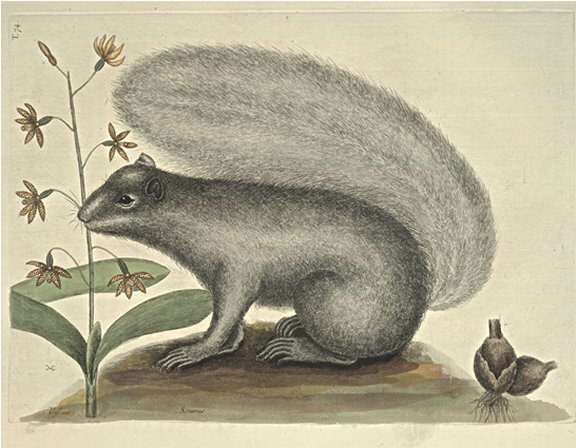 These Squirrels are as large as an half grown Rabbit, the whole Structure of their Bodies and Limbs, thicker in Proportion, and of a grosser and more clumsy Make than our common Squirrels. Their Heads and Ears are also shorter. The Colour of their Bodies is gray, as is their Tails, which when they turn back extends the whole Length of, and covers their Bodies. They have the like active Gestures as the common Squirrels. Their Size is no Protection against the Assaults and Rapine of ravenous Hawks. They are injurious to the Planters of Virginia and Carolina, by destroying their Corn and Pulse. This Plant rises from a bulbose Root, with three or four Leaves, like those of the Narcissus, having one strait single Stem, to the Height of twelve or more Inches, on each Side of which are eight, ten, or more Flowers, set alternately on pretty long Footstalks; Five yellow Petals, spotted with dark brown, set on a green cylindrical, ribbed Capsula, with Stamina, compose the Flower; in the Seed Vessel are contained a great many very small Seeds, divided by thin Membranes. These Plants grow on Rocks, and to the Truncs of Trees in many of the Bahama Islands.